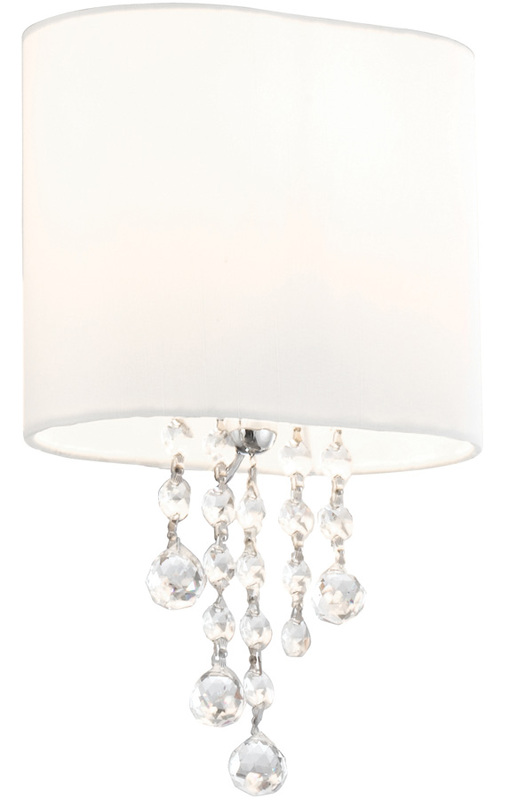 This Nina polished chrome switched wall light with white shade and crystal beads is elegant and sophisticated. Featuring a square chrome wall bracket and oval white fabric outer shade, with strings of faceted crystal beads hanging below. Ideal for an airy bedroom, living room, hallway or dining room wall. The large oval shaped shade is made from quality white fabric, with spherical crystal droplets hanging gracefully from its centre. It is fitted with a handy rocker switch and looks stunning on any wall in your home. There are matching fittings in the Nina lighting range that includes five and eight-light chandelier; please see below. This stunning chandelier is supplied by Searchlight who manufacture some of the best traditional and modern classic designs such as the Nina polished chrome switched wall light with white shade and crystal beads you see here.